I know I have or would have if it hadn’t been for local friends or a great guide book. 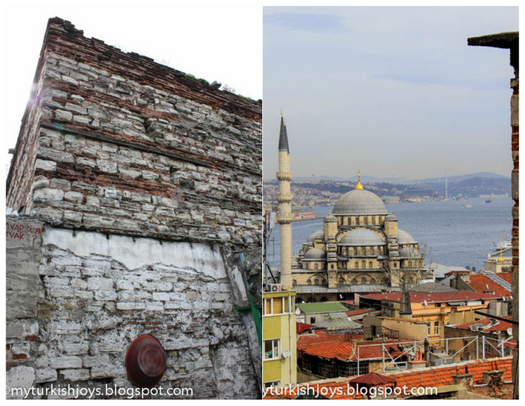 One such “secret” place that was on my Istanbul bucket list for awhile was the Büyük Valide Han, built in 1651. 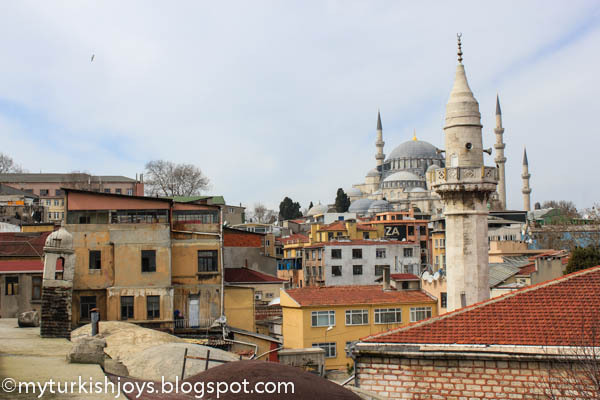 This crumbling han in Eminönü doesn’t look like much on the outside, but it’s what the rooftop offered is what I wanted to see. 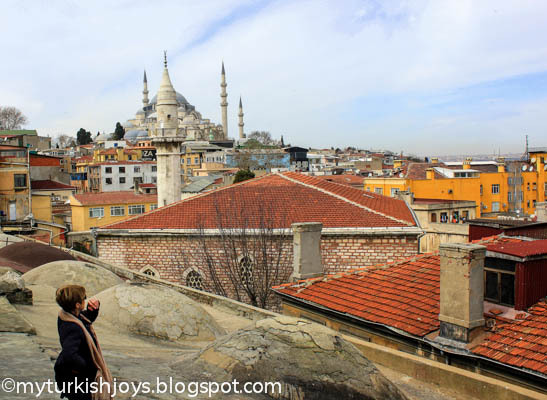 One day with the assistance of my friend Sharon and a must-have guidebook, “Istanbul’s Bazaar Quarter: Backstreet Walking Tours,” we went exploring my favorite backstreets. As regular readers know, I love walking through this neighborhood and wandering by the old hans (see: Kürkcü Han post), fabric stores, the countless bead displays and the bric-à-brac shops. I try and envision what this place looked like centuries ago as weary travelers stopped here along the famed Silk Road. We turned down several tiny streets, with Sharon asking for directions along the way. The guide book does a good job explaining directions, but these streets can be confusing even for someone who’s lived here a long time. According to Reşat Ekrem Koçu’s “Encyclopedia of Istanbul” (1958-1971), a significant part of the Sağır Han collapsed first in August 1909 and again in March 1926. However, the han has survived until today by way of (typical) ad hoc additions and repairs. 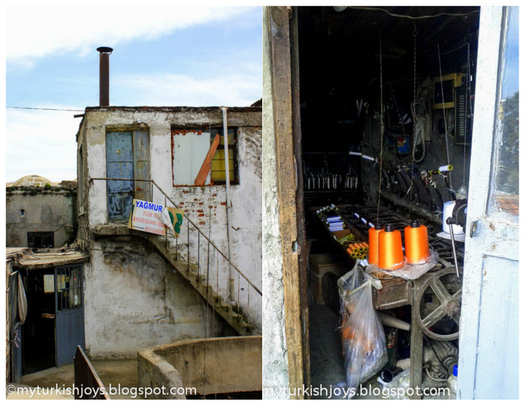 Sağır means deaf in Turkish, and I have to wander if the name referred to the deafening sound emanating from the han at one point from old weaving machines. That’s the story I’ve heard referenced to other hans in the area. The han’s courtyard would have been used to stable the travelers’ horses. Outside and inside the doors at Sağır Han in Istanbul. In the courtyard to our left, we found a ramshackle staircase and climbed up. We’re always up for an adventure, and I wanted to see the view. 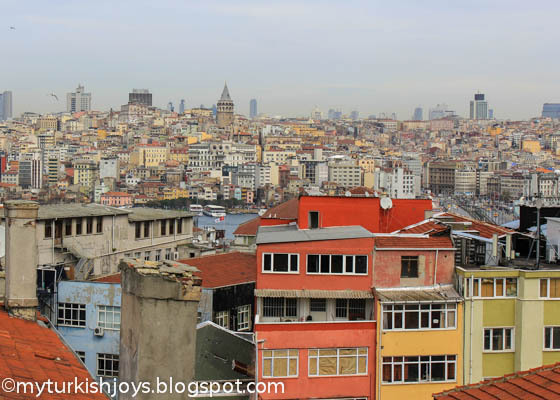 From the han’s rooftop, you can see across the Bosphorus to the Galata Tower, the Bosphorus Bridge, the Süleymaniye Camii and the Yeni Camii. The view is breathtaking! 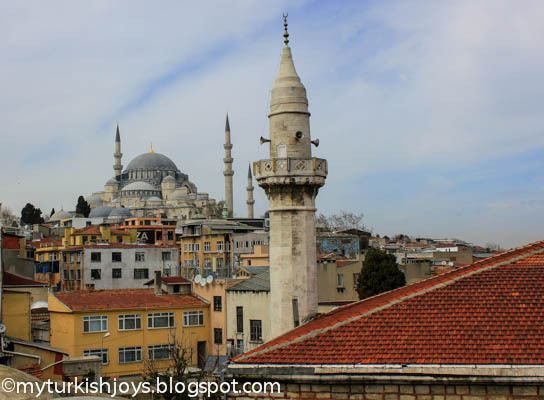 Süleymaniye Camii is the one sitting on the hill in the background here. My friend Sharon has lived in Istanbul for 17 years and never knew about this han. 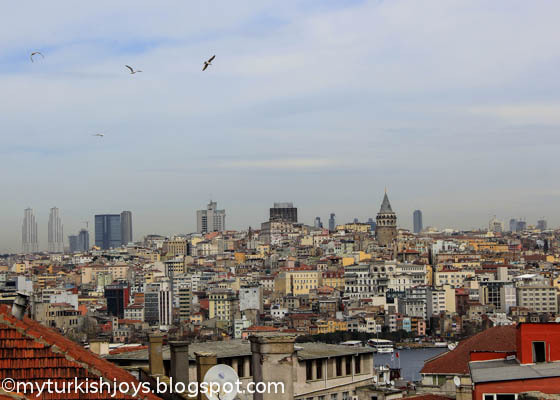 Also from the rooftop, you will see the faded brick and stone Tower of Eirene, dating back to the Byzantine era (11th century), in the northeast corner. The tower was “once 27 meters high and at one time its top floor was used as a small mosque,” according to the guidebook. You may not always know about these kinds of places, but you need to ask, explore and maybe get a little lost to find them. Sharon takes a moment to admire the view from the han. On the left, you can see one of the han's original domed chimneys. You are my favorite blogger! Thank you so much for the new pictures and info.I've lived 45 years in Istanbul but you show me something new every time or something I know and enjoy seeing again in a great picture. how wonderful....that city could be explored endlessly! How are you getting on? 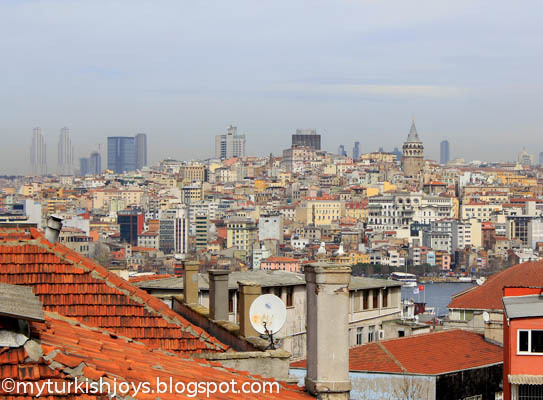 Are you missing Istanbul yet? @Joyce, yes it can! I believe I've done a fairly good job exploring the city, but there's always more to discover. @Annie, can't you tell? I'm still working on my feelings. hi I discovered that secret place while I was at Sagırhan to take pictures. It is really hard to find maybe a tourist cant even pass through cause of not feeling comfort but there is no danger and you may see that wonder. Hi Meissoun, how cool! I'll have to try and check it out in person. 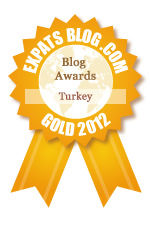 Hoping to make an Istanbul trip this year.